CHICAGO (WLS) -- Two people are being charged after a police chase that started in northwest Indiana Thursday morning and ended on the South Side. The Indiana Lake County Sheriff's office said that the chase started in Cedar Lake, Indiana, at 133rd and Calumet at 8:34 a.m. when a police canine unit attempted to stop a stolen silver Mercedes. The chase went on for over an hour through parts of Indiana, Illinois and Chicago before the pickup truck stopped at 93rd Street and May Street in the Washington Heights neighborhood. Authorities said the suspects fled in that car until stopping at IL-394 and 159th Street, where they exited the and took off on foot. The officer and his dog were hit by a second vehicle while exiting the police car. 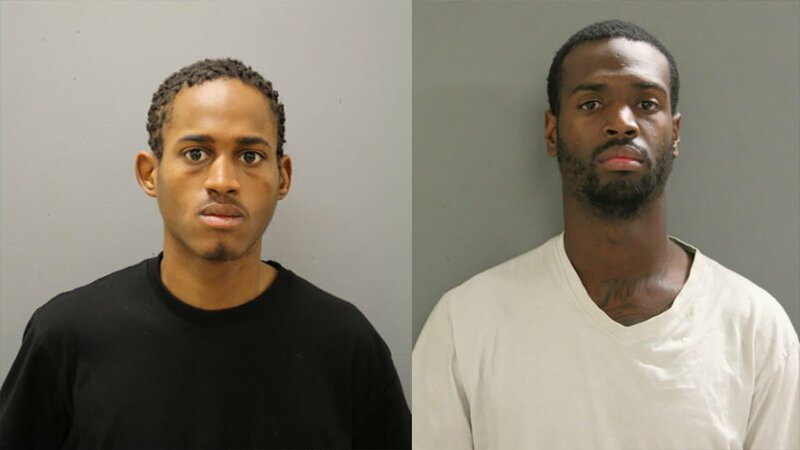 The suspects then stole a white Ford pickup truck and were pursued by Illinois State Police and CPD on I-94, I-57 and Chicago city streets until stopping at 93rd and May Street. Police said the officer suffered minor injuries. The dog suffered from a broken paw. The Lake County Sheriff's Office said Friday that the officer and the dog are recovering well.